This morning I was poking around on some of my fav websites and saw a short article about a smoothie that stood out to me because of the tremendous amount of information being shared lately about one if its key ingredients: the fabulous spice Turmeric. I personally buy it in bulk (Frontier Natural Products Co-Op brand, 1lb – I get it via Vitacost) and just fill my spice bottle when needed. Known mainly for cooking up in Indian cuisine, Turmeric has a lot of other health benefits, one being a crazy good anti-inflammatory, antiviral, antibacterial, antioxidant… a lot of “anit’s” 🙂 My hubby puts it on his eggs in the morning, makes a rockin’ grilled shrimp dish with it (recipe to come 🙂 ), and there is so much more that can be done with this healing spice. ANYWAY, this article shared a yummy smoothie recipe utilizing this great spice, along with some other key ingredients, as well. 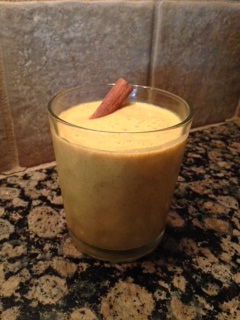 The smoothie recipe was adapted from the Collective Evolution article Turmeric Smoothie Recipe. I am going to relay it to you the exact way I made it this morning, as it was the perfect way, with this combo of ingredients, to start my day. Add all ingredients into a Vitamix or high-powered blender and process until smooth. The article said to try to drink this smoothie in the morning before you have anything to eat. It is creamy and soothing, and it was a great way to start of the day! We don’t eat a lot of meat on a regular basis, but when we do, we have come to love this recipe. 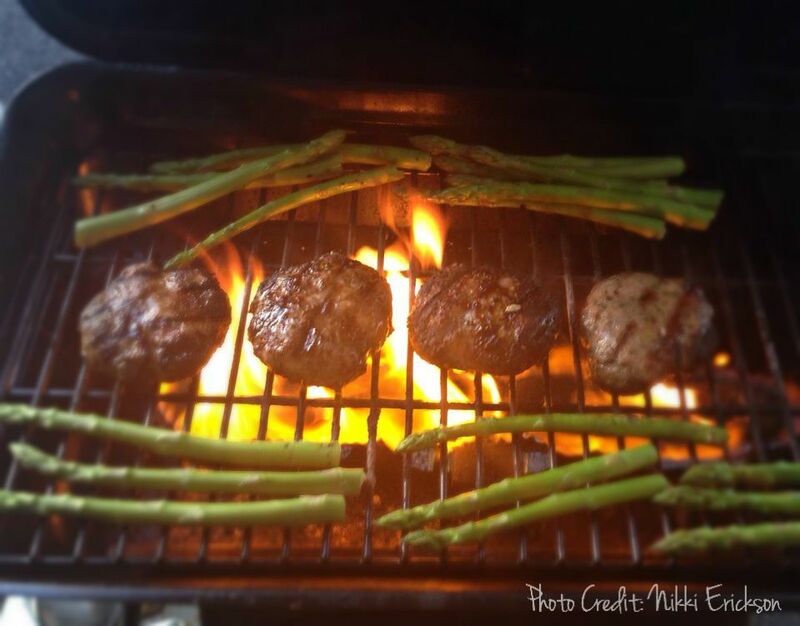 We love lamb – lamb chops, burgers, grilled, cooked in the cast iron… etc. Organic, grass-fed lamb also has some nice health benefits. This recipe is wonderful! We used freshly chopped herbs from our “terrace cotta pot garden” 🙂 that made them even more special! We chose to make this recipe GLUTEN-FREE and DAIRY-FREE by not using pita rounds/buns or feta/goat cheese, however you can dress up with the optional below fixin’s, which are incredibly complimentary to them. Serve with a side of sautéed green beans or grilled asparagus. *IDEA: Try additional dressings like fresh spinach leaves, grilled or roasted red peppers and a slice of red onion. Scrumptious! Preheat grill at a high heat. Put the lamb in a large bowl, and mix with the mint, cilantro, oregano, and garlic. Season with cumin, allspice, red pepper flakes, salt, and black pepper, and mix well. Shape into 4patties. Marinate patties in olive oil and fresh squeezed lemon juice for 30 minutes. Brush grill with oil. Sear burgers on each side for 1-2 minutes, for desired charring. For a medium temperature burger, reduce heat to low and cook each side for 5-6 minutes. Heat the pita pockets or buns briefly on the grill. Serve burgers alone or the option to wrap them in pitas/buns and dress with feta or goat cheese. Organic, grass-fed lamb sourced from local farms is about as good as you can get. The cleaner the meat, the better. For example, organic standards help lower the risk of lamb getting contaminated feed and 100% grass-fed lamb may be available from local farms with small flocks, which provides a more natural life and environment for their them. Lamb is high in omega-3 and 6 fats, selenium, zinc and B-12, as well as other important B vitamins. And good evening! 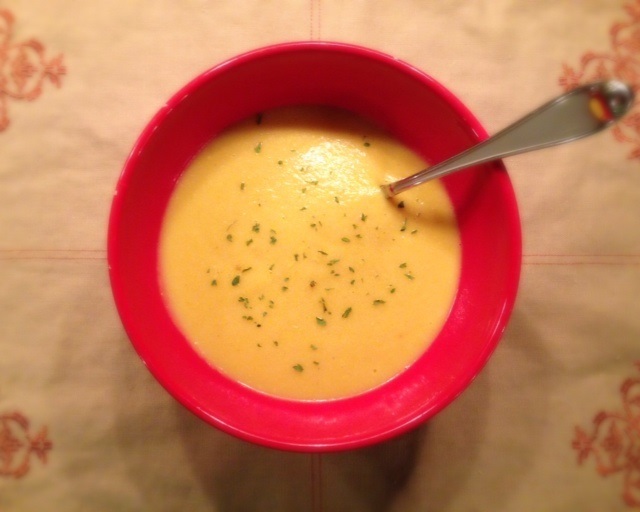 My husband found this soup recipe last week and we wanted to test it out. Originally adapted from a PaleoLeap recipe, I made some small tweaks and it turned into a vegan dish! It is perfectly delightful! 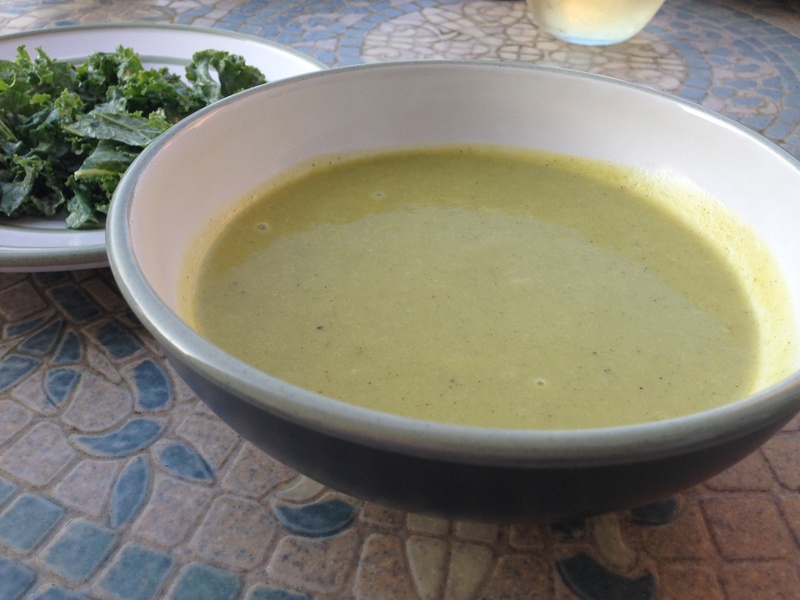 Zucchini’s are in season, so try this fabulous soup tonight! We had it alongside a filling Kale salad that was simply dressed with tahini, lemon juice, salt and pepper. Heat coconut oil (or the cooking oil of choice) in a saucepan placed over a medium heat. Add the onion, garlic and zucchinis and cook about 5 minutes. 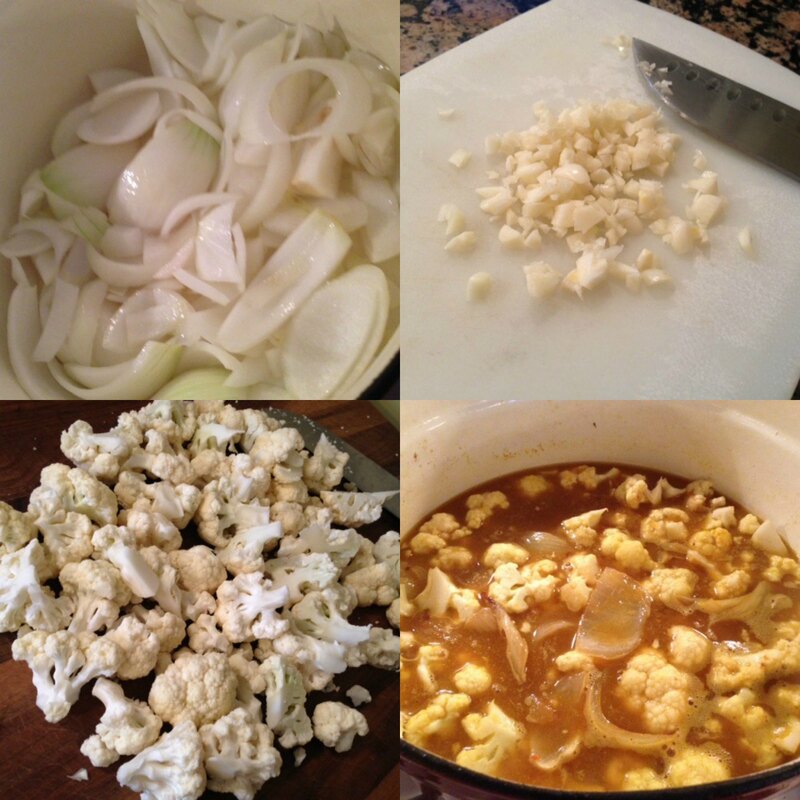 Add the vegetable stock, season to taste with salt and pepper, and bring to a boil. Lower the heat, cover, and let simmer until the zucchinis are tender, around 20 minutes. Remove from the heat, add the coconut milk (or non-dairy milk of choice), and purée with an immersion blender (or pour into a Vitamix, or a high-powered blender). Continue to adjust the seasoning if need be and serve hot. Zucchini has high water content and are low in calories. They are a source of folate, potassium, and vitamins A and C. Zucchini can lower cholesterol, help prevent cancer as it helps with oxidative stress, is an anti-inflammatory and is a powerful antioxidant, assists in prostate health with its phytonutrients, reduces the risk of heart attack, stroke and lowers blood pressure, AND is high in manganese, which is key in supporting ALL of the above prevention.